Three Songs About Motherland depicts a dramatic collision between the past, the present, and the future in contemporary Russia by focusing on three different cities in this vast land. In the far eastern city of Komsomolsk-on-Amur, a still living symbol of Soviet industrialization in the 1930s, older Russian citizens speak about their youth when they felt part of something bigger than themselves––building "a city of communist dreams" in the middle of nowhere. Some cling to the promise of those glory days while others express regret and disappointment at its ultimate failure. Then, the cosmopolitan city of Moscow bids farewell to Anna Politkovskaya, the fearless journalist and human rights activist who was assassinated for her political activity amid the chaotic power struggles of the post-Soviet nation, fighting to her death for a young Russian democracy. Finally, residents of Khanty-Mansijsk, one of the main centers of Siberia's budding oil industry, speak about their beloved fairy-tale-like town, where the communist dream has been swept away by new aspirations for a prosperous future. And what are they, today's aspirations? What is behind the fairy tale? Will the new "capitalist dream" come true or will it turn out to be another illusion, another myth? Marina Goldovskaya is a Russian born documentary cinematographer famed for her candid portrayal of people. She has made thirty-two documentary films and more than one hundred programs for Russian, Austrian, French, German and American television. 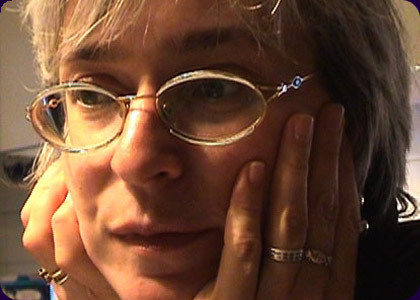 Marina was the first Russian filmmaker to introduce a personal diary style in the documentary genre to describe the social changes in Russia and how they affected the lives of the people. She used this style in The Shattered Mirror and in Lucky to Be Born in Russia, which chronicled the emotions of Russians living through the turmoil of perestroika culminating in the putsch of October 1993. The Shattered Mirror (ARTE, France) was honored with Prix Italia, the Golden Gate award in San Francisco and the Golden Hugo in Chicago. In 1996 Marina, a tenured professor at the UCLA School of Theater, Film and Television, created a public forum for documentaries by organizing the Documentary Salon Series.